Post-coup situation update, Tuesday, March 27: For many Bamakois, today was the first day back at work since last week’s coup, following yesterday’s holiday commemorating the 1991 ouster of dictator Moussa Traoré. Civil servants had a strong incentive to get to the office on time: the ruling junta had decreed that any government employee who did not turn up for work by 7:30 this morning would be sacked and replaced. Unfortunately, many of those who did turn up found it impossible to work, since their offices had been cleaned out by looters following the coup. Staff members in two different ministries told me their computers and office equipment had been stolen, office safes emptied of cash, and even coffee break supplies taken. Otherwise, business in Bamako was fairly typical for a Tuesday: shops were open, traffic downtown was heavy and people were out shopping. I did speak to a merchant who knew of a nearby business that had been looted, but I saw no evidence of looting personally. What stood out to me during my errands around the city today was the banks: they were crowded, many closed before noon, and there was often no cash to be had from automatic teller machines. Some banks are limiting withdrawals to head off a cash shortage. While this could simply be an effect of nervous depositors needing extra money after several days without access to it, a rumor is circulating that the BCEAO — the central bank for Mali and the other seven countries in West Africa’s CFA Franc zone — has closed its doors in Bamako and stopped supplying money to Malian banks. If the central bank rumor is confirmed — and one Malian paper says it is true — such measures would fit with a growing international effort to isolate Mali’s ruling junta economically. The U.S. suspended all non-humanitarian assistance to Mali on Monday, to the tune of $70 million, and the African Development Bank and the World Bank had already suspended aid. Malian newspapers are back on newsstands and online for the first time since the coup began last Wednesday. Some papers have come out in favor of the coup, (e.g. Inter de Bamako, Mali Demain) while others are critical (e.g. L’Indépendent, L’Indicateur Renouveau, Le Canard déchainé). The state newspaper L’Essor, meanwhile, has run an article describing the events of the coup without editorializing about them. The French government announced yesterday that it had made contact with deposed President Amadou Toumani Touré by telephone, and reported him to be safe and in good condition, but his location remains unknown. Mann’s analysis raises a question I’ve pondered since we got our first glimpse of Mali’s coup plotters on Malian state television, early in the morning of March 22: What are these guys after? While I cannot take the putschists’ justifications of their actions at face value, I also cannot say what their motivations are. 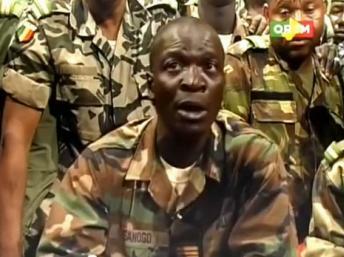 Did these junior army officers set out deliberately to derail Mali’s democratic process and seize power for themselves? I doubt it. More likely, they simply filled a void that opened up before them, without either adequately preparing for or fully considering the consequences of their actions. Here’s why I think this is the case. From the coup’s earliest hours and continuing to the present, its leaders have been terribly disorganized. Consider the chronology of events: after they took over state TV and radio facilities around 3 p.m. on Wednesday the 21st, it took more than 12 hours before they broadcast a statement to the Malian people explaining who they were and what they wanted. That statement, when it was finally read by Lt. Amadou Konaté, mentioned Touré’s “incompetent and disavowed regime” and proposed a government of national unity formed in consultation with the nation’s “forces vives” (a vague phrase meaning the leading segments of a population). It promised to hand over power to a democratically elected president “as soon as national unity and territorially integrity will be reestablished.” Konaté’s statement was followed by a communiqué read by Captain Amadou Sanogo, speaking with a hoarse voice, that included the requisite appeals for calm and condemnations of looting. Both announcements were full of generalities but short on specifics. 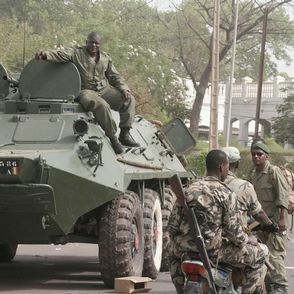 In the early days of his coup, Sanogo claimed he wanted more resources to fight MNLA rebels than the government of President Touré was willing to provide. Just days after the coup, however, he invited the MNLA to the negotiating table, seemingly following the same strategy as the man he ousted. “Everything is negotiable, except the territorial integrity and the unity of our country,” Sanogo said during his televised address on Monday. But the MNLA has repeatedly stated that its insistence on independence for the swath of northern Mali it calls “Azawad” is non-negotiable. Next, in considering whether this coup was planned or unplanned, I want to return to the question of Captain Sanogo’s wardrobe. In his first television appearance (see photo at right), he is shown wearing ordinary camouflage fatigues — the green-and-brown “woodland” pattern — with only a badge of rank visible. 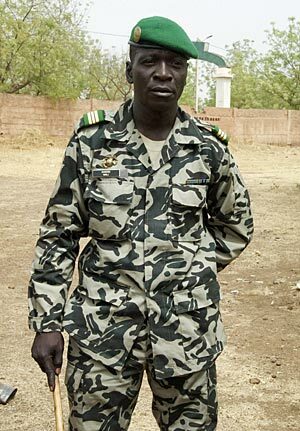 Woodland camouflage is often associated with Mali’s elite parachute regiment, of which Sanogo has never been a member. In all his subsequent appearances, he wears different fatigues (either desert pattern or olive green), more typical of rank-and-file troops, but always with a US Marines pin on his chest, often with a dozofini garment under his shirt and a stick in hand. These last three items seem to be “power objects” which have become key to his public image. If they mean that much to him, why would he not have these objects on his person when making his first address to the nation? If he had come to work that morning intending to mount a coup, why wouldn’t he have worn his dozofini, the Mande answer to body armor? A final piece of evidence that suggests the spontaneous origins of this coup is the name the ruling junta chose for itself: Le Comité National pour le Redressement de la Démocratie et la Restauration de l’Etat (National Committee for Recovering Democracy and Restoring the State). Regardless of whether it signals the true motivations of the putschists, this has to be the worst name for any governing body in living memory — awkward to say and uninspiring to hear. ORTM journalists and even Captain Sanogo himself continually struggle on air to get its exact wording straight, and have frequently misstated its abbreviation. Early abbreviations tended toward “CNRDR,” as though the final état were absent, but in the last few days “CNRDRE” has been used more commonly (though still not exclusively) in state media. If you were going to plan out a coup, wouldn’t you at least come up with a name for your junta that you could remember? All in all, I get the impression Captain Sanogo and his colleagues are in over their heads trying to run this country, address the mounting rebellion in the north, and somehow prepare a transition back to constitutional rule (if that is indeed their intention). They are improvising. Irrespective of Sanogo’s motives — he clearly feels that he did the right thing by taking power — the first days of this junta have inspired no confidence that he and his associates are up to the task they have set for themselves. Perhaps quite soon another void will open up, and other actors on Mali’s political stage will try to fill it. Let us hope they do so not only with the right motives, but with the means and skills to realize their aims. Great post, thanks for keeping us all informed of what is going on in Bamako. Thank you. If possible would you comment on current or future status of Peace Corp and NGO’s. I can’t answer your question at the present but will see what info I can gather. Thanks again for your insight Bruce – have been following you posts closely. Keep safe. Thanks a lot for your analysis! As a fellow Carl and a former student in Mali, thank you, from the bottom of my heart for your blog. Please keep up the excellent work and analysis. To easily get money from ATMs, I would advise you go to those hidden ATMs of BDM (Banque de Développement du Mali) located inside hotel lounges (Azalaï Nord-Sud, Grand Hotel, Salam etc). There is generally no cash shortage in those places. Best. Merci bien – unfortunately my MasterCard doesn’t work in BDM machines! But I did have some luck getting cash from one BIM and one Banque Atlantique machine on Tuesday. Lassana did not have any luck getting money out in Bamako yesterday or today, but we have tried MoneyGram. Cross your fingers, not sure if it will work yet. Bruce, I’ll echo all the other comments about your great insight that one can’t find anywhere else. I now live in Niger and was in the country for the 2010 coup. However, Niger’s coup plotters were inherently better organized (along family/tribal lines) in comparison to what you’re describing in Mali. Within a few days it was clear in Niger that the coup leaders were serious and accepted by the public. The military members who took charge of various institutions at that time seemed humble and generally restrained, if not expressly reluctant to be in power. The foreign community largely stayed in place after the coup, though many left later due to terrorist incidents and insecurity around the capital that were unrelated to the actual coup d’etat. Your situation appears much more tenuous than what we experienced in Niger and that worries me. Please take care and put your family first in any decisions!